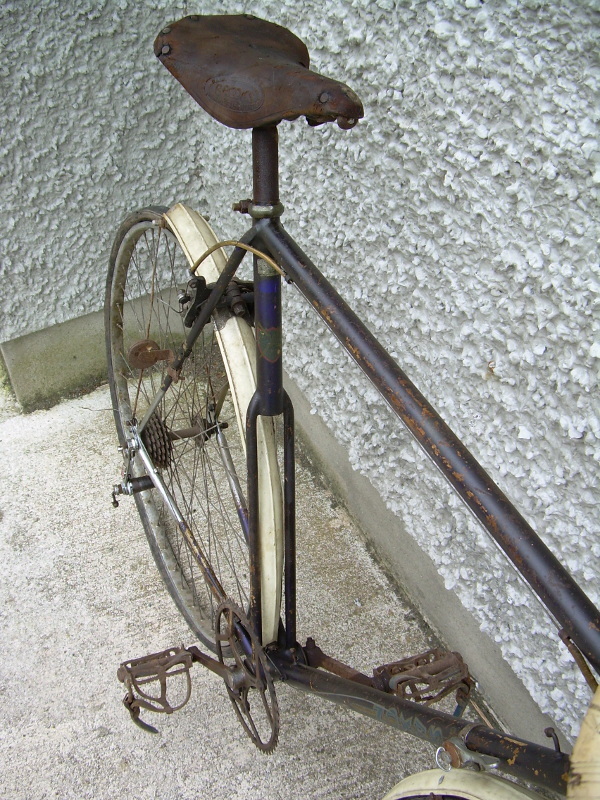 I was recently very kindly given a Peugeot frame – a PH12E Centenary model with some of the original parts still fitted. Unlike a lot of the similar survivors on the internet, this example has been used and obviously had an active life. Paintwork is tired and transfers are rubbed. The question arises, is it worth restoring? My answer is a resounding “Yes”, firstly because the bike rather than been put away, “because it is a centenary model and might be worth something”, was actually ridden as intended. It has a history of use and shows signs of that use. Secondly, Peugeot embraced the 'aerodynamic' culture of the time and fitted some now rare parts to the bike. The great French rider Bernard Hinault, 5 times winner of the Tour de France had ridden a specially built Reynolds tubed aerodynamic Gitane time trial bike in the late 1970s. Cycling Weekly (UK) coverage of the time featured riders in skinsuits riding time trials which was to lead to the development of low profile time trial bikes with smaller front wheels. These would see use in the professional peloton time trials, until banned by the UCI. Greg Lemond pioneered the use of Tri-bars to obtain a more rider aerodynamic position in the professional peloton. Shimano produced it's 'aero' AX600 and AX Dura Ace between 1981 and 1984 according to the Velobase website. The frame I was given was missing the wheels, Simplex SLJ6600 rear mech and the top mounted down tube levers. The orginal parts fitted would obviously stay, but could I find the correct replacement parts? The most serious challenge would be the Simplex rear mech. I believe the SLJ6600 was introduced in 1982 and was the first mech to to have an angled parallogram like Suntour and Shimano. The original rear mech was branded 'aérodynamic'. Apart from the scarcity of the mechs, the other factor would be price and condition. According to to Disraeli Gears page entry for the Simplex SLJ6600, the springs lost tension very quickly rendering the mech less than effective. This probably explains why the original rear mech was missing. A search on French ebay over several weeks identified a few examples for sale. Some were the later 'SPIDEL' branded version and other examples looked to be in poor condition from the seller's photographs, but not reflected in their asking price. I eventually located what appeared to be a good example and managed to secure it by auction including delivery for a fraction of some of the asking prices on ebay in the UK. Probably one of the biggest hurdles in terms of sourcing original parts had been overcome. I was also gifted boxes of parts along with the Peugeot frame. During the sorting process, I came across a set of Maeda Suntour top mounting down tube levers carefully bagged up. A quick check proved these were off the Peugeot, so another major headache in terms of original parts, was thankfully overcome. 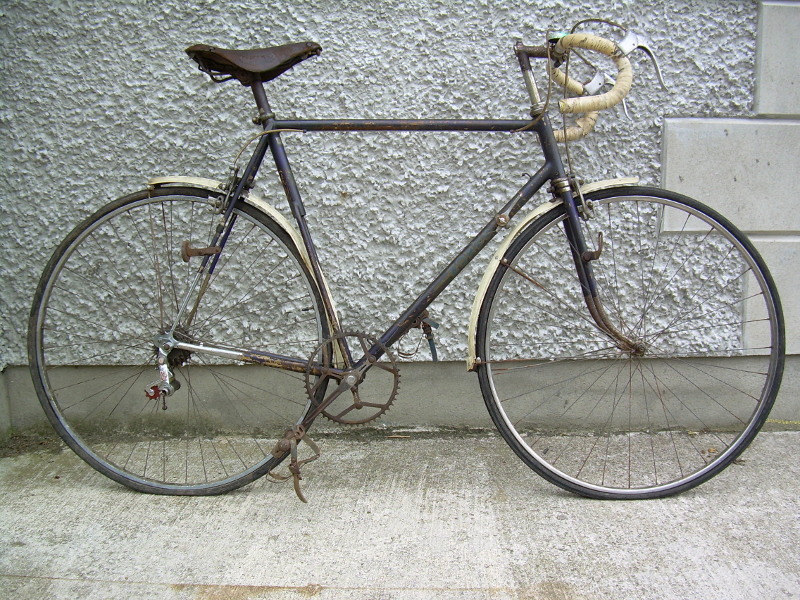 The Peugeot PH12 model was usually made from steel Carbolite tubing, the frame having the appearance of being lugless, but in fact the lugs are internal. Whilst a carbolite tubed frame is not as light as one built with Reynolds or Columbus tubing, fitted with a decent set of wheels, these Peugeot bikes ride very well indeed. Probably a lot to do with the French frame geometry. The 1982 Carbolite tubed Centenary PH12E has an 'aero' seat tube and down tube. The gear cables are routed internally through the down tube from the top mounted friction levers. The other significant thing is, the down tube friction levers and chainset are Japanese, not French. The chainset is an alloy SR Custom model with detachable alloy chainrings, a change from the usual Stronglight alloy crank with swaged steel chainrings. 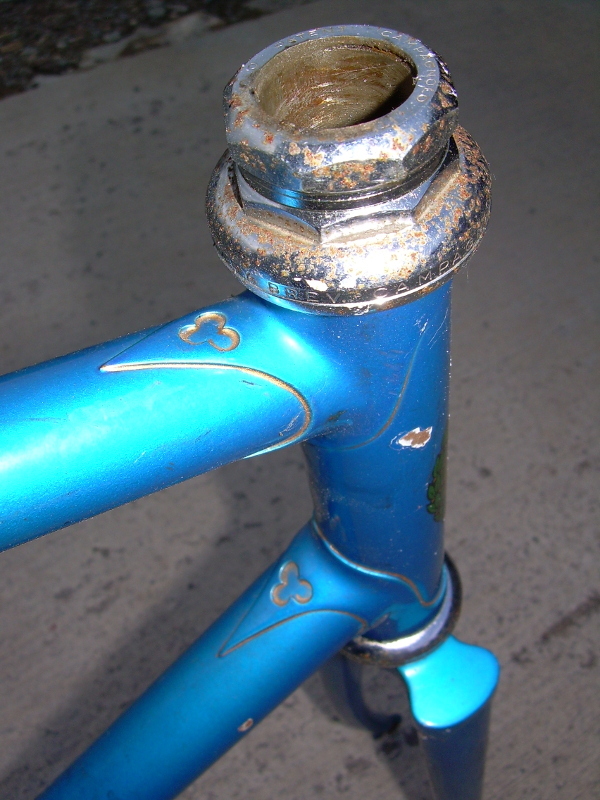 The 'aero' style seat tube means the seatpin, from necessity, is very short. The top of the seat tube is round to accept the seatpin, but as the seat tube quickly changes profile, the seatpin has to be much shorter than would be found on a bicycle with a full round seat tube. 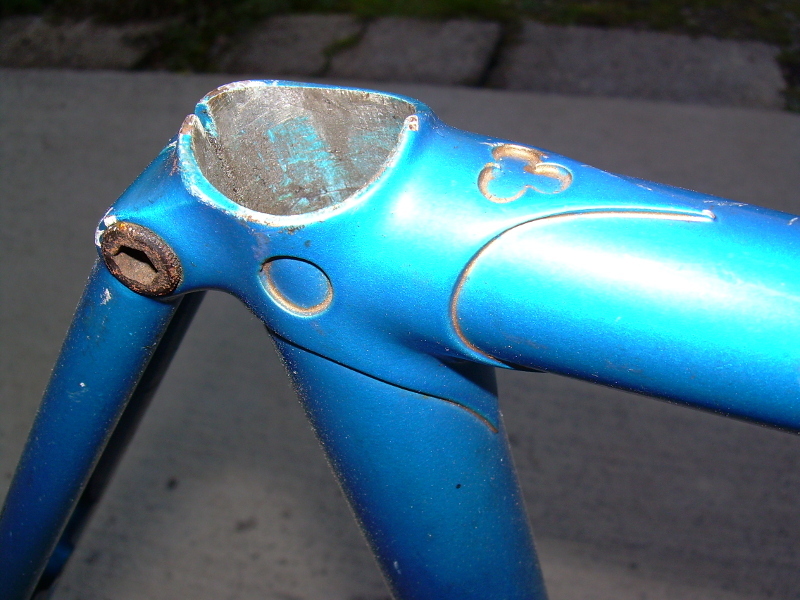 Again, Peugeot use a much smaller diameter seatpin than found on other bicycles. The original seat post is a plain model, necked in at the top, the original saddle being retained by a steel seat clamp bolt arrangement. 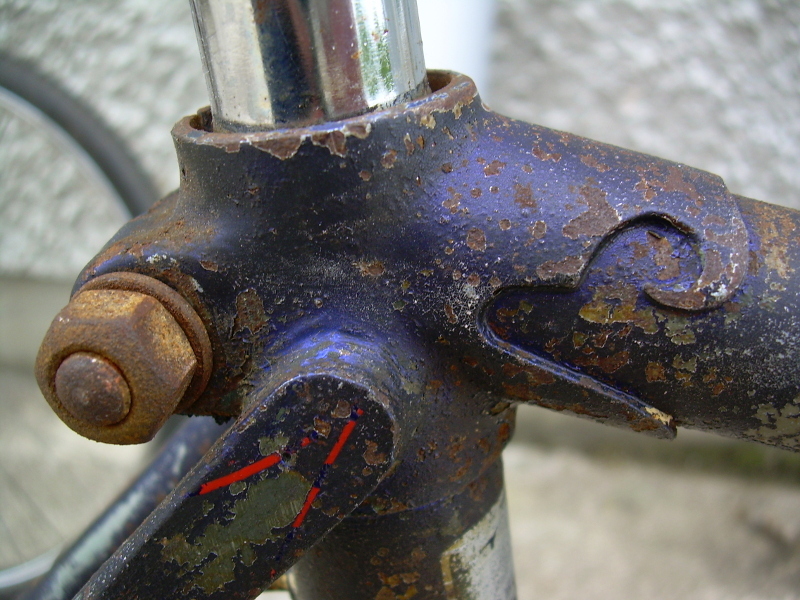 In amongst, the various store of parts within the Springhill Cycle Collection, there was an alloy one piece seatpin with an integral seat clamp. It has been in the store for a number of years and although not original to the Peugeot it will be used on the bike as a nice finishing touch. It is an unusual and certainly period correct part. The upshot of all this is, the 57cm frame will not suit a tall rider because of the short seatpin. It is my intention to restore the bike as close as I can using period correct parts. I still have to source the correct Mavic rims and a small flange Q/R rear hub with a 1982 date code to complete the wheels. The fact some parts are missing may have more to do with their lack of durability/suitability as the bike was heavily used. 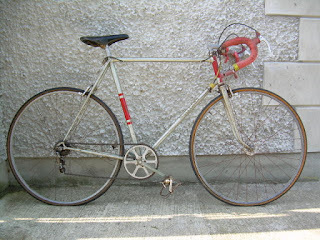 I will probably fit a pre-owned Concor saddle and replace the Lyotard flat steel touring pedals that have been fitted in lieu of the 'aero' type pedals that were original to the bike. Although the Shimano PD-1050 105 are 5 years later than the bike, they will make a reasonable substitute. They are in keeping with the 'aero' theme and could represent a likely modification during the bike's working life. 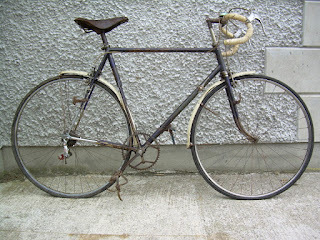 The Springhill Cycle Collection is happy to restore the bike in an as used condition. 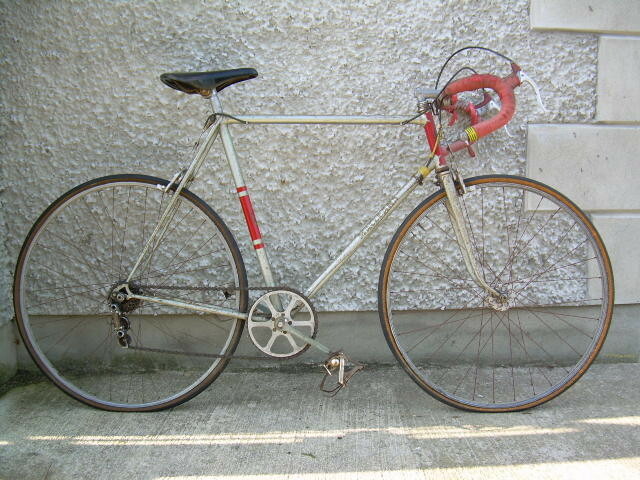 It means the collection now holds a 1982 Peugeot Centenary model along with a similar, used, 1987 Raleigh Centenary edition bike. As the summer slips past and cooler shorter days take hold it gives time to reflect on the years rides with the Veteran-Cycle Club. This is not a cycling club, although many members are cyclists. The club is for people interested in old cycles and encourages members to meet and ride these old machines. I was not able to attend all local section rides this year, but I did make the effort to attend as many as I could. The summer in this part of the world has been wet and often windy. Events take place across the province of Ulster, the last ride of the summer season was in County Donegal on the Fanad Peninsular. The route afforded some spectacular views of Lough Swilly on reasonably lightly trafficked roads starting and finishing on the quayside at Ramelton. There are buildings on the quayside with a date stone above the door 'L & L S R 1864'. The interesting thing is the Londonderry & Lough Swilly Railway never had a station at Ramelton! The route went via Rathmullan on the shores of Lough Swilly. A short detour was made to Rathmullan House, now a country hotel. This 18th Century house was bought by Robert Batt who was the youngest son of Narcissus Batt (1760 – 1840) , a founder of the Belfast Bank. The Batt family had property at Ozier Hill, in Co. Wexford and at Purdysburn, Co. Down. Rathmullan House was part of a 4,377 acre estate in 1876. Robert Batt purchased Rathmullan House in 1837 and it remained in family ownership through the generations until 1939. The associated land was bought by the tenant farmers under the various land acts passed by the Liberal Government between 1870 and 1906. Rathmullan is also notable for seeing the end of the Gaelic Order with the 'flight of the Earls' to the continent of Europe. There is a statue on the foreshore below the Victorian Coastguard cottages at Rathmullan, to commemorate the event. One of joys of taking part in the V-CC rides is to see a newly restored machine make it's debut back on the road. Cycles which made an appearance this year are a Sunbeam roadster, Claud Butler Lady's bike and an early Leader of Croydon. The weather was kind for the last summer run and the food bought in Rathmullan was excellent. A pleasant ride back to the start followed as the clouds cleared. The tide had come in at Ramelton by the time of our return. The run ended with a lovely sunset to round off a great day.